What Should Central Bankers Do? No, this is not a question on the final exam for Money and Monetary Policy; however, it has been. It’s also a question that pervades contemporary political economy in the US and Europe. Federal Reserve Chair, Ben Benanke continues to be criticized from both those who advocate aggressive monetary policy and those who argue that the Fed has been too aggressive. For example, today’s Wall Street Journal features “Fed bashing” from the House Financial Services Committee. The Fed’s easy-money policy and actions taken to boost economic growth have prevented lawmakers from taking responsibility for shoring up the economic recovery and reducing the deep federal budget deficit, some Republicans said Tuesday at a hearing of a panel of the House Financial Services Committee. “As the Fed does more, Congress is doing less and in the long term that slows our recovery,” said Rep. Kevin Brady (R., Texas). How are we to interpret this? 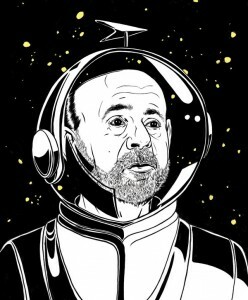 Mr. Bernanke, since you did your job appropriately, we won’t (can’t?) do ours?? Of course, many pundits, especially those who fear a tripling of the Fed’s balance sheet since 2008, believe that the world would be better without the Fed. Anyone ever heard of Ron Paul? The industrial countries have a choice. They can act as if all is well except that their consumers are in a funk and so what John Maynard Keynes called “animal spirits” must be revived through stimulus measures. Or they can treat the crisis as a wake-up call and move to fix all that has been papered over in the last few decades and thus put themselves in a better position to take advantage of coming opportunities. For better or worse, the narrative that persuades these countries’ governments and publics will determine their futures — and that of the global economy. So, what should Central Bankers do? In my view, they should recognize that monetary policy has its limits and that using monetary policy as a means to generate sustained employment won’t work. Longer term structural adjustments are required. Such adjustments will be the subject of another blog posting. Why didn’t the fiscal stimulus have large effects on employment? As noted previously, cheap capital and expensive labor tend to lead to the substitution of capital for labor – after all capital is often called “labor saving devices” for a reason. 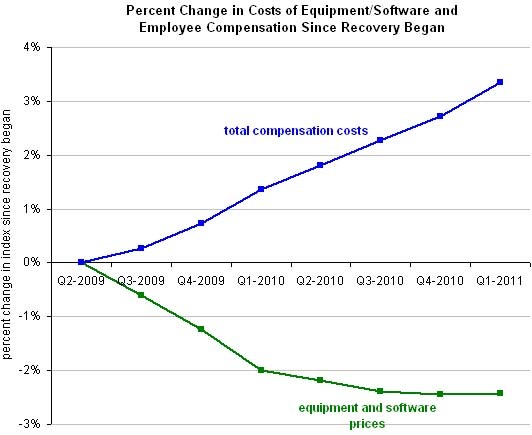 Now, we have solid evidence that the total cost (wages or salary and benefits) of labor has risen markedly while equipment and software costs have fallen since 2009. For the rest of the story, see Catharine Rampall’s NY Times Economix blog last Friday entitled “Man vs. Machine.” To put it most starkly, if your job can be replaced by an algorithm, it probably will be. As those who took Econ 320 should know, if you attempt to implement macroeconomic stabilization policy without understanding the microeconomics of labor markets, you may not be blessed with success. Who is Dominique Strauss-Kahn? Why Should Anyone Care? Answers to the first question are obvious. Strauss-Kahn is the Managing Director of the International Monetary Fund. As undoubtedly you have heard, he was arrested recently for sexually attacking a maid in his luxury suite at a New York Hotel. He also was expected to be a strong candidate for the Presidency of France. His exit from the political scene is imminent. So is this good news or bad news? Actually, these two results are largely unrelated to one another. The unemployment rate is derived from a household survey which also revealed that the number of employed people rose by 117,000, that is almost the trend rate. The payroll survey tends to look at relatively older companies, which typically do not drive employment growth. James Hamilton, in a recent Econbrowser piece, lays out some of the relevant details. 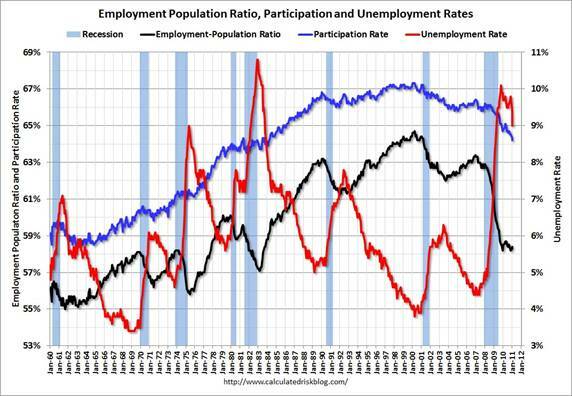 The chart below highlights key labor market patterns. 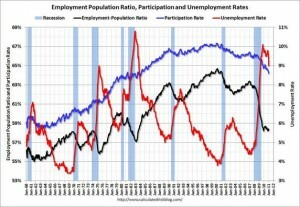 The relatively low level of labor force participation puts downward pressure on the unemployment rate, which is why that indicator is not particularly informative with regard to the JOBS, JOBS, JOBS agenda. The details will entertain those of you who will take Econ 320 next term. On December 1st, the President’s Commission on Fiscal Responsibility and Reform published its report on how taxes and spending patterns can be made sustainable. For the most part, the report contains the recommendations of its two c0-chairs Republican Alan Simpson and Democrat Erskine Bowles. The report garnered support from 11 of the 18 commission members. I encourage everyone to at least peruse the report. As noted in a November 11th blog entry , it’s a serious attempt to change the unsustainable fiscal path for the U.S. Federal Government. The U.S. is number 4 according to the global competitiveness survey just released by the World Economic Forum. It dropped from second to fourth in the past year. Switzerland, Sweden, and Singapore (is there something about S?) lie above the US. What’s behind these rankings? Should anyone care? See today’s Financial Times Lex column for both an editorial opinion on the survey and for a link to the full report. The website for the report contains profiles of each country as well as informative commentary about its meaning. Paul Krugman rejects the claims that Raghuram Rajan makes about why the US entered the financial crisis. Furthermore he argues that the cause is not particularly important and that more macroeconomic policy stimulus is needed until the US returns to pre-recession levels of employment and GDP. Rajan argues that such stimulus is partly the reason why the crisis was created and that fundamental reform is required. Cafe Hayek provides links to both articles in a recent posting. Raghuram Rajan responds to criticism from Krugman and Wells. Much of his response will be familiar to Cafe Hayek readers but it is convenient to have all of Krugman’s mistakes about the housing bubble assembled in one place. For a variety of reasons, Chinese economic policy makers resist pressures to allow the yuan (or renminbi) to rise against the dollar. On this side of the great pond (i.e., the Pacific Ocean), politicians (see H.R. 2378 Ryan-Murphy bill) and many economists clamor for explicit pressure that “forces” the Chinese to allow the yuan to appreciate. What would happen if the yuan were to rise markedly against the dollar? Several observations are worth making. 1. Much of the trade deficit that exists between the US and China arises from the sale of final goods. The value added by Chinese firms in these goods, however, is rather small. So what? If the yuan rises, it means that Chinese firms will be able to purchase intermediate goods more cheaply than at present; thus, the decrease in the cost of Chinese goods in yuan terms will counter the rise in the exchange rate and limit the change in prices to American consumers. 2. It’s not clear that changes in the nominal exchange rate drive large changes in purchasing. For example, the Japanese yen was forced to appreciate against the dollar in the late 1980s. Such a rise has had limited impact on trade with Japan. The U.S. runs trade deficits with virtually all of its major trading partners. This is a natural outgrowth of diminishing savings relative to (tangible) investment over past three decades. 3. On a related point, Gillian Tett, in today’s Financial Times argues that the Japanese experience with a rising yuan could be replicated in China. Unless China reforms its banking and financial system in a way that decentralizes the allocation of capital, it may suffer the economic stagnation that Japan has suffered for the past two decades. Cheap capital, centrally allocated, tends to yield excess capacity in politically sensitive industries. I have heard this argument on many occasions in China. If China’s economy were to suffer a long period of weakness, demand for US, European, and Asia goods would diminish, not rise. 4. The iron triangle or impossible trilogy restricts countries from having a) open capital markets, b) a fixed exchange rate, and c) independent monetary policy at the same time. Different countries, based on the depth and breadth of their domestic capital markets and their social time preferences, as well as their desire to attract capital, make different choices. China chooses some combination of capital controls and limited monetary independence along with a fixed exchange rate. The US and Europe, with much more developed capital markets, choose to allow exchange rates to float. Small countries, dependent on world trade and world interest rates, such as Hong Kong and Estonia, forgo independent monetary policy. There is no right choice. Each country manipulates the tools it believes give it the highest level of economic welfare. My advice to US policy makers: be careful what you ask for. In today’s Financial Times, economists Carmen and Vincent Reinhart summarize their address given last week at the Kansas City Feds’ annual symposium which features central bankers from all over the world. The Reinharts warn us that financial crises of the sort we are emerging from do not generate robust rebounds. Such optimism, however, may be premature. We have analysed data on numerous severe economic dislocations over the past three-quarters of a century; a record of misfortune including 15 severe post-second world war crises, the Great Depression and the 1973-74 oil shock. The result is a bracing warning that the future is likely to bring only hard choices. But if we continue as others have before, the need to deleverage will dampen employment and growth for some time to come. Although aggressive use of fiscal and monetary policies may be necessary to avoid the risks of economic depression, they are no substitute for changes in expectations and economic structure required to find a stable long term economic growth path. Attempts to avoid such “creative destructive” will only deepen the cost of the inevitable adjustment that must take place. What Should Central Bankers Do To Address PLOGs? I find the final sentence of the opinion piece particularly instructive. Do you find that your friends lose interest when you start discussing the nuances of Keynsian and Hayekian views on boom-and-bust cycles? Well, this might be just the video to help you get your point across. The messages seem to align with my admittedly-limited understanding of macro theory, and I’m pretty certain Russ Roberts knows more about these issues than I do. And it has received critical kudos from Alex Tabarrok. I’ll look forward to hearing this blaring in 120 and 320 in the coming years.